In March, the Sydney Women's AFL played the local New South Wales (Australia) Women's GAA in an International Rules match. It is hoped that this will see the start of cooperation and expansion for the women's version of the two codes in NSW, perhaps even leading to a women's IR series between Australia and Ireland. "We thought it would be fun to see what the international game is like. The match was jointly hosted by Sydney Women's AFL and the women from the NSW Gaelic Athletic Association, and played as part of Sydney Women's AFL's pre-season calendar in March. We billed it as "the start of a beautiful rivalry", in the hope that there would be lots of fun re-matches into the future! Teams for most international rules matches are probably determined by country-of-origin, but we preferred to enforce a strict "code-of-origin" rule: we didn't care what your passport said, we only cared which code you'd played first. As a result, the Gaelic team was about half Irish half Aussie, while the Aussie Rules team was mostly Aussie but of course with a few internationals (Kiwis, Poms and the like). Both teams were given a quick run down of the rules pre-match by our ref, who had himself only learned the rules about 15 minutes earlier. We had invited a couple of Sydney Swans AFL players along to the match, and they made themselves useful as assistant coaches to each team. The game was played at quite a pace and in an excellent spirit, and the Gaelic footballers even coped with being tackled. We used the rules from the most recent international rules series between Australia and Ireland, on a modified Aussie Rules oval. I'd like to say that the Aussie Rules team won, but as it turned out the Gaelic girls were too fast, too fit and just too good! Must be just about time for one of those re-matches..."
The flyer for the game is worth a gander, and match photos are on the SWAFL website, though the rivalry was such fun the final score seems to have been forgotten. Below is the flyer from the match. The game opens up all sorts of future possiblities. Women's Aussie Rules is a growing sport (see related website) and Women's Gaelic football is also growing rapidly in Australia. In fact the Women's Australasian Gaelic football team has won the past two Gaelic Football World Cups in Dublin. Not only did they last time defeat teams from London, New York, rest of England & Wales, rest of USA, Scotland, Canada and Europe, but they comprehensively thrashed a local Dublin club and the highly fancied Irish Defence Forces team. Part of that skill rests on the fact Women's Gaelic is like a straight mix of basketball/netball with soccer/footy skills and Australian sportswomen are amongst the world's best at these. In Ireland Women's ("Ladies") football has been the fastest growing sport for 15 years and the All Ireland Women's Football Final is the most watched women's team sport event at a national level anywhere in the world. A crowd of 20,706, down on 2003's 30k plus, braved horrendous conditions on Sunday 3rd October to see the Galway "Tribeswomen" defeat the Dublin "Jackies", whilst the TV ratings were the usual annual bonanza for Irish TV station TG4. 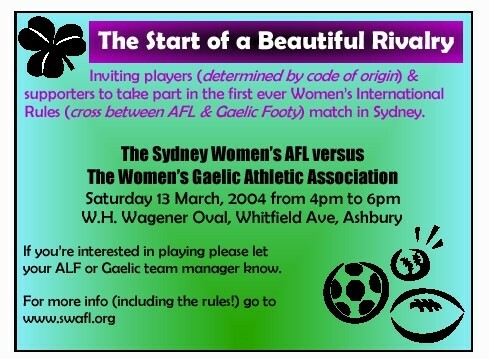 In Dublin in 2002 many in the GAA commented that the Australasian team (it was all Aussies, though not to disparage the Gaelic scene in Auckland that is alive and well) was as good as some women's County sides in Ireland. This raises the intriguing question of how well would an Australian Women's IR team, comprising the best from Aussie women's Gaelic and Aussie Rules, go against an Irish national Ladies team? Certainly with the amazing success of Women's football in Ireland there would be sponsors. Women's Gaelic already has the direct pick up of the ball off the ground that IR and Aussie rules have but men's Gaelic does not. Whether the Irish women would accept the IR level of tackling is debatable but some modification of the tackle could be introduced. What is of no doubt is that as a curtain-raiser to the men's Test matches the gals would double the Aussie-Irish rivalry and make an afternoon/night of great entertainment for the fans. From the US, Leigh Swansborough of US Women's Footy reports that whilst women in southern California haven't played any IR games, both the US women's footy team, Orange County Bombshells, and the O.C. Roisins women's Gaelic team have players that play for both. It raises the possibility that if the Men's series moves to Tri-Nations with the USA (as mooted by the AFL & GAA as a long term possibility) a women's series could also follow (or even precede) in suit.